With nearly 7 billion mouths to feed, conventional human agriculture places a tremendous strain on our planet. At Urban Farmer, we understand your goal to better our planet by establishing your own set of growing solutions. We believe that this process should be as easy and affordable as possible to help you ensure the continuing sustainability of our planet. To reap the benefits of city-based agriculture, you must first have the right tools and equipment to begin. At Urban Farmer, our goal is to provide our customers with the best shopping experience possible by offering the newest products, outstanding service and selection, and the best prices for your grow needs. Create a greener future, today! Start or continue your grow journey with Urban Farmer's reliable, efficient, and affordable products. With our products, we can work together to raise awareness for health and wellness, and inspire and educate to create an environmentally sustainable system to help uplift communities around the globe. Where can you find the perfect controlled environment for your indoor grows that will save you money, time, and equipment? 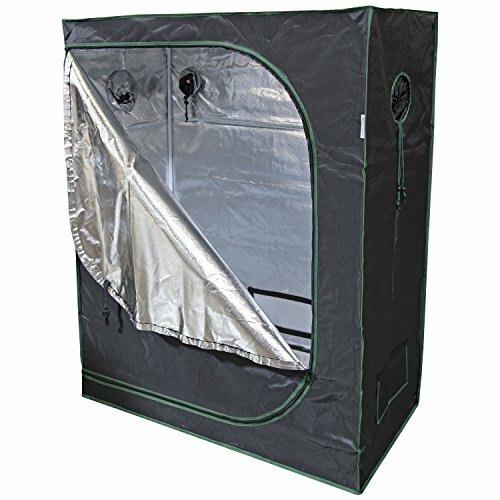 Look no further than Urban Farmer's top quality Mylar Hydroponic Grow Tents for indoor plant growing. At Urban Farmer, we believe that grow tents are an essential item when managing an indoor garden. There are many key benefits to investing in our tents, including energy efficiency, odor reduction, cleaner air, and maximum lighting. Equipped with flood-proof floors, heavy-duty doors with zippers, and thick Velcro panels, these necessary features are designed to create an airtight seal to prohibit odors and pests from coming in and keeping unwanted air out. Whether your goal is to grow vegetables, fruits, or other types of plants, Urban Farmer's Mylar Hydroponic Grow Tents offer versatile and durable features to keep your grows covered from head to toe. Size - 48" x 24" x 60"
If you have any questions about this product by Urban Farmer, contact us by completing and submitting the form below. If you are looking for a specif part number, please include it with your message.